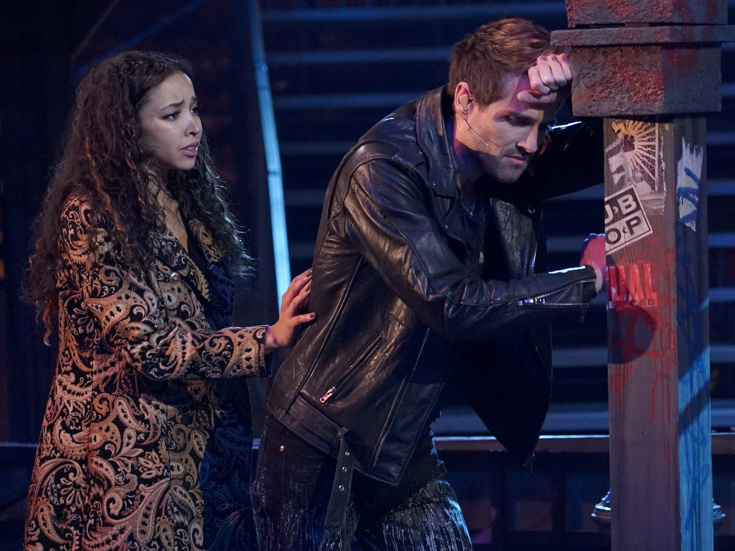 Tinashe as Mimi & Brennin Hunt as Roger in Fox's "Rent"
You okay, honey? Ratings weren't so great for Sunday night's Fox network presentation of Jonathan Larson's groundbreaking musical Rent. The Tony and Pulitzer winner about a group of friends surviving and thriving in New York City at the height of the AIDS crisis was seen by just 3.4 million viewers, falling below every television musical since the first, NBC's Sound of Music Live (18.6 million) and lower than the previously least-performing, Fox's A Christmas Story Live! (4.5 million), Variety reports. On the bright side, Rent was one of the highest performers of Sunday-night television in the demographic of ages 18-49. Directed by original Rent helmer Michael Greif and featuring stage stars including Hamilton alums Jordan Fisher and Brandon Victor Dixon and Waitress vet Keala Settle, Fox's presentation hit a speedbump during dress rehearsal when an injury was sustained by Brennin Hunt, who was cast as Roger, forcing the network to offer up a pre-recorded version for much of the night. Capping the evening was a live appearance by the original cast of Rent singing a "Seasons of Love" reprise that kept fans happy. The next TV musical set to air is Hair Live!, scheduled for May 19 on NBC. Also to come are NBC's currently delayed live play A Few Good Men starring Alec Baldwin and the musical Bye Bye Birdie headlined by Jennifer Lopez. Currently, Fox doesn't have another musical event planned. A full list of ratings for past TV musicals can be found below.